It’s rare that I actually go to a theater to catch a movie these days. Even rarer that I see a movie on release day. But ever since I read the book, I knew Wonder was a tale worth making an exception for. 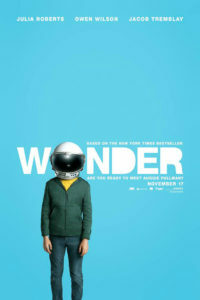 Wonder is the story of August (Auggie) Pullman, a 10 year old boy, with severe facial abnormalities, who lives with his parents & elder sister Olivia (Via) in North River Heights, New York. He has been home-schooled all his life (as his condition required several surgeries while he was growing up), but now is gearing up to attend Beecher Prep, a private middle school in North River Heights. Considering the fact that he hasn’t ever gone to a mainstream school, and that his experiences around kids in general haven’t been too great (primarily because of how he looks), Auggie isn’t particularly excited to go to Beecher Prep. But he agrees anyway, because it’s what his parents want for him, and he knows that they only have his best interests at heart. Oh and his decision was probably influenced by the fact that his folks assured him that he can quit anytime he wants to, if he decides that school isn’t for him. So Wonder is essentially the story of Auggie’s 5th grade year, told mostly from his perspective, but also partly from the perspective of some other kids in his life, including his sister & some of his & her friends. I have reviewed the book here, so I am not going to get into the reading experience again. This post is essentially about my thoughts on the movie, and how it compares to the book. To begin with, I have to admit that I had high expectations from the movie, especially after checking out the trailers (here and here), cause they were simply amazing. In-fact I loved them so much that even though I had really liked the book, I had a feeling that the movie was going to be better. And I have always been in the ‘book-is-always-better-than-the-movie’ club, so this was definitely a novelty for me. Now, after having seen the movie, I don’t think it’s better than the book, but instead, they are both pretty amazing in different ways. Of-course the story line is quite similar (it’s an adaptation after all) but it’s not the same as the book. There have been some changes that have been made, mostly to accommodate the format. And most of the changes I didn’t really care about, but I was kinda disappointed to see that Summer’s role in Auggie’s life was discounted in favor of making Jack’s role more prominent. I mean I do understand they had to do it to keep the story relatively simple, as you can only convey so much (without confusing the audience) in 1.5 hours (which is the run time). But I adored Summer, and would have loved it if her awesomeness was reflected (in its full glory) in the screen adaptation too. Having said that, I was pleasantly surprised to see that multiple POVs were incorporated in the movie, as that was one of my favorite things about the book – the ability to see Auggie from a different perspective than his own. So basically, they’ve changed a few things around, but also retained some things from the book, and I feel that all of it was done keeping in mind what suited which media best. So, while the book is an amazing read, the movie (though a little different) is wonderful & heart-warming in its own way. Wonder is a story with a lot of heart, and while the movie might not be a true adaptation, it’s a very good one, ’cause even if the tale is altered in some places to suit the media, the spirit and message have been kept intact, and in this case, those are the most important things. So I would definitely recommend the movie to fans of the book. But even if you haven’t read the book, I strongly recommend it – both the book and the movie. To everyone, really, but definitely to parents who have kids around Auggie’s age (or older or younger, okay basically everyone) – this is one book/movie you don’t want to miss. Because the message of empathy & kindness is one that cannot be heard and shared often enough. That’s all from my end, folks. I would love to hear from you guys. Have you seen Wonder? Or for that matter have you read it? If not, I’d definitely recommend you to check out the book first, but then make sure to see the movie as well. The film hasn’t yet released in India but I am very excited to go watch it. I’m so relieved they haven’t messed with it. Yes, they have stayed true to the spirit of the book, and while I enjoyed both of them in different ways, the book was so much better! I’ll wait to see the movie after I’ve read the book. Knowing our tastes I’m sure I’ll love the book. Need to watch the movie soon!Thanks for the feedback Shantala! This sounds like an amazing book and movie. I haven’t even heard of it, so thank you, Shantala for reviewing it here. Is it in the movie theatres right now? R. J. PALACIO is a good writer & I read her book which is her first novel WONDER, it’s quite interested well, now I heard movie WONDER so I am very excited to watch. Thanks for your article you have written well & explained well especially book vs movie. Ever since i saw the promo of the movie, it really intrigued me and wanted to watch it 🙂 Thanks for this review! The book has been in my TBR for too long now. Now that the movie is out, maybe it is time I picked it and your review gave the necessary kick in the you-know-where to start. I watched the movie today and completely loved it. In fact, the family loved it. I have just started on the book and look forward to reading it after your hearty recommendation.